So March is International Women’s History Month, and I don’t think I can begin to talk about that without looking back at the most important woman in my life, my mother Pat. She was a trailblazer, a woman in a leadership role in the corporate world in the early 70’s. At that time, most of my friends’ moms either didn’t work outside the home, or if they did, they were secretaries, not bosses. Pat was a single mother, raised in poverty with a grade 10 education, who went on to be the president of her own hugely successful corporate training company. I’m a Second City performer and director who has worked in corporate training with Second City Works for over 20 years. When I think about the challenges women face in the workplace, I look back at my mother, who raised me to believe that I could do anything, and who led by example. While we’ve definitely made progress in the workplace, when it comes to gender equality, it’s not nearly enough. In fact, according to one US study, at the current pace women won’t achieve pay equity until 2095. Perhaps, this is why there’s a petition to keep the new statue of the Fearless Girl with her hands on her hips, facing off against the iconic Wall Street bull, not just for a week as originally planned, but as a permanent reminder of gender equality and the need to increase the number of women in corporate boardrooms and leadership roles. Yes, things have definitely changed, but we need to keep equality front and center to keep heading in the right direction. Just last year, Second City Works developed two new training programs: Women in Leadership and Diversity and Inclusion, responding to our clients’ desire for specific training that acknowledges the need for a more inclusive corporate culture. Companies know that disparity exists; they’re paying attention, and working hard to align their training with their goals. It’s not just the women who say that, it’s the men too. It’s universal to be critical of ourselves, and in doing so we can be our own worst enemy. Our exercises help participants to let go of their fear of failure, embrace change and capitalize on their own individuality. 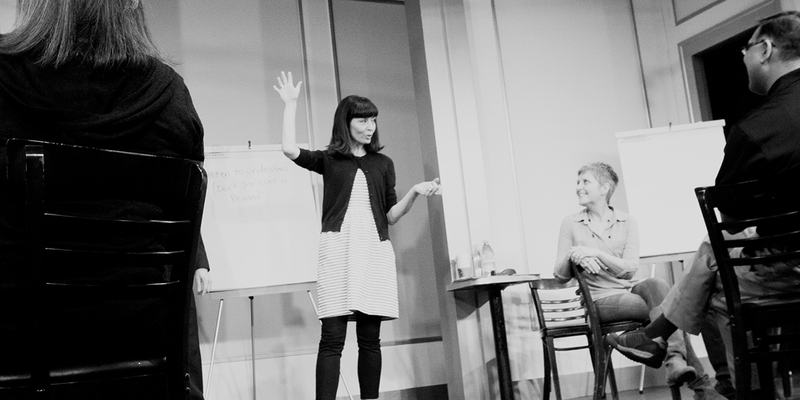 So much of the training that we do at Second City Works is focused on empowerment. Although, our workshops are customized to fit the needs of individual clients, our end goal is always the same – empowering the participants by sharing techniques to build flexibility, collaboration, empathy, and effective communication while remaining “others-focused”. Our sessions allow participants to feel more confident, trust their instincts, and gain insights into the human need behind certain behaviors. Most importantly, they learn through laughter, working as ensemble players in experiential learning, and bonding in the process. After one session, I once had a woman tearfully tell me in the ladies room, “I’ve worked here for 15 years and today is the first time I really feel like I got to know my co-workers!” She was a bit shy and reluctant to step outside of her own silo, but now she was glowing with pride and excitement – the picture of empowerment. As women, we are sometimes burdened with a heightened awareness of how we are perceived, because we often feel judged by different standards. But knowledge is, as we know, a powerful tool. At a recent training session in New York, I was talking about the power of an apology after an interruption, when a female participant responded, “No, that won’t fly in the boardroom. We’ve learned that as women, we apologize too much. It makes us look weak.” Her comment revealed a compelling reality about the world she operates in, and she didn’t hesitate to share it, even though it seemed to contradict what I was saying. She wasn’t worried about being polite or “nice”; she was focused on communicating clearly and authentically – both in our training session and in her office. She was adapting her personal style to fit her reality, and I recognized that in her case, she needed to be cognizant of over-apologizing. Neither of us worried “Hey, maybe she should apologize less because that’s what men do.” She simply incorporated a note she received and moved on, as did I. At Second City, we call that “knowing your audience.” We can’t put up our shows without constant feedback and incorporating that feedback to refine our work. We call that our process, and it takes us from a blank page to the stage. The reality is that we are empowered when we are flexible and adaptable without overthinking and analyzing everything. So no question, we need more to change, and hopefully before 2095, but what can we do right now? At Second City we tell our actors, “Play the scene you’re in, not the scene you want to be in.” In other words, we must play the moment we’re in, just like a performer, informed by the reality of the scene, but always looking forward, driven by the possibility of what lies ahead. 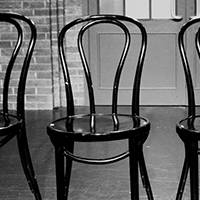 As improvisers we thrive in a world that is always changing, and where anything is possible. And, maybe that’s what we can do as women, here in March of 2017. We can look ahead, empowered, unafraid of failure, aware of the real, imperfect world we live in, but confident in our ability to continue to change it. 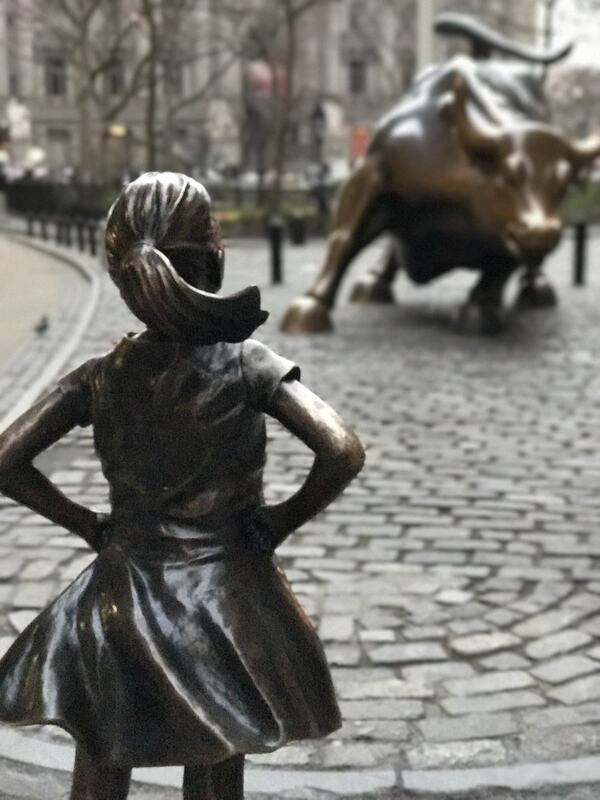 As for me, I’m going to try to be more like that Fearless Girl; facing off against the bull, hands on hips, not backing down. She reminds me of so many of the brave, thoughtful, fearless women I’ve worked with in our training sessions at Second City Works. But most of all, she reminds me of my mom.